Whatever his ratings, Obama remains personally popular, widely acknowledged for his soaring oratory. His words were one of the lasting legacies of his presidential campaign and are proving to be among his most effective governing weapons. In Power in Words, distinguished historian and civil rights activist Mary Frances Berry and former presidential speechwriter Josh Gottheimer introduce Obama’s most memorable speeches, from his October 2002 speech against the war in Iraq and his November 2008 election-night victory speech to “A More Perfect Union,” his March 2008 response to the Reverend Wright controversy, and lesser-known but revealing speeches, such as one given in Nairobi, Kenya, in August 2006. For each speech, Berry and Gottheimer add a rich introduction that includes political analysis, provides insight and historical context, and features commentary straight from the speechwriters themselves including Jon Favreau, Obama’s chief speechwriter, and several other Obama campaign writers. Compelling and enduring, Power in Words delivers the behind-the-scenes account of Obama’s rhetorical legacy and is a collection to relish for years to come. “Words matter, especially in a time of crisis. Learn how Obama’s words got him elected, and why it matters to all of us, in this engaging look at his rise to the presidency.”—Eric Schmidt, chair/CEO of Google Inc.
It’s fair to say that when it comes to politics, there are few things Americans agree on. That said, there is one thing that’s not debatable: Barack Obama can deliver one hell of a campaign speech. Even those who don’t agree with his policies can recall the first time they heard Obama, the candidate, thunder away to a crowd of adoring listeners. For many, the first time they heard Obama was his call for hope and unity at the 2004 Democratic National Convention; for others, it was the first time they heard his now-famous mantra, “Yes, we can”--with its roots in Cesar Chavez’s 1972 “S”, se puede” campaign--on the evening of the New Hampshire primary. There are few politicians in American history who have used the stage more effectively. You may have a different view of Obama the president and of his rhetoric in the White House. You may not agree with his policies, or you may believe, like some, that he has overused the presidential podium-- or that his deeds have fallen short of his words. You may believe that his signature promises of change and political unity have given way to traditional stagnation and partisanship. We will leave it to history, and to another author, to judge his presidency, because one thing is clear: the rules of governing are much different than those of campaigning. Presidents have different agendas from candidates. Candidates must convince the public to vote for them, and the press to adore them; a candidate’s agenda is not to convince the Congress or the special interests to pass legislation. They are firing up a crowd at a rally of screaming supporters, not delivering a sober speech from the Oval Office on an impending war. This book covers a period of time that is already inscribed in the annals of politics: the rise and rhetoric of Barack Obama from state senator to president of the United States. 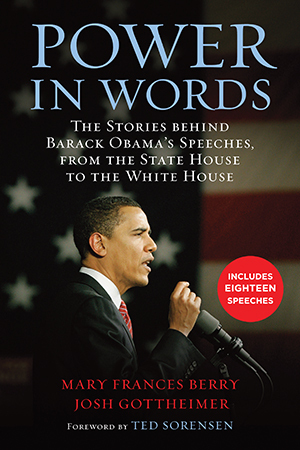 It uses eighteen of Obama’s most important political speeches to tell the story of his remarkable ascent and his unprecedented use of the podium to win over a strong majority of the American public. As you will see, it’s not just about the words themselves, but the stories behind them--why they were chosen, how they were shaped, and their impact on the race. The narrative draws on several sources: first-hand accounts from Obama’s speechwriters, analysis from journalists and others who covered the presidential campaign, and insights from our own experience in presidential politics, policymaking, and speechwriting. You will meet the five speechwriters who helped Obama craft and communicate the “change” message he embodied and get a behind-thescenes view of their fast-paced world of swigging Red Bull and pulling all-nighter writing sessions. What will be clear throughout the book is that Barack Obama and his writers understood the impact his words could have on the race and on his ultimate success. The title itself, Power in Words, comes from Barack Obama’s presidential announcement speech in February 2007 in Springfield, Illinois, when he said, “The life of a tall, gangly, self-made Springfield lawyer tells us that a different future is possible. He tells us that there is power in words.” Obama uttered those words only a few feet from where his political hero, Abraham Lincoln, a former Illinois state legislator and trial lawyer, declared his aspirations to the highest office in the land. “Power in words” is not a direct quote from Lincoln. Obama was paraphrasing Lincoln, who understood that words mattered; he was fastidious about the language he used to communicate with the country. Lincoln understood the power of words like few of his contemporaries-- he knew that his rhetoric was one of the most powerful tools of persuasion he possessed. He was not particularly verbose: it was about the quality, not quantity, of his words. There was a purpose, a thoughtfulness behind every word he delivered, and history has judged his rhetoric kindly. Lincoln’s Second Inaugural Address was only 703 words in length and 505 of those were one-syllable words. In advance of the speech, the Associated Press reported that it would be “brief--not exceeding, probably a column in length.” They were about right. Lincoln weighed carefully every word of his Second Inaugural, which was ultimately delivered on March 4, 1865, with the country still mired down in the Civil War. He understood that it would take a remarkable public campaign to convince the country to continue the bloodiest war in history, against their fellow citizens, to outlaw slavery. Obama, too, recognized the impact he had on the stump. When he spoke about hope or change, or when he was forced to address himself to the race issue, the American people listened intently. He knew he had to choose his words wisely and that he could persuade, and dissuade, in an instant. Obama was not the first presidential candidate to learn from Lincoln. Theodore Roosevelt coined the phrase “bully pulpit” because he believed that he could use the presidential podium and the direct communication with the American public it provided to “bully” Congress into enacting his agenda. Franklin Roosevelt likewise was a master communicator who seized the radio airwaves, then a brand-new medium, to allay the nation’s fears during the Great Depression and sell his ambitious New Deal program. John Kennedy used the stump and a new political tool, television, to help win the presidency and the hearts of millions of Americans. Decades later, Ronald Reagan earned the moniker the Great Communicator for his masterful use of the public stage, using it to unify the country behind his agenda. Bill Clinton took a page out of the Reagan playbook as the Great Empathizer; few politicians felt more comfortable, and were more popular, on the world stage. Thus, compared to his successors, Lincoln hardly ever used the bully pulpit to go over the heads of Congress and address the American people directly. In the eighteenth century, it wasn’t customary for presidents to speak directly and with frequency to the American people. Tulis reported that our earliest presidents spent most of their time working behind closed doors with Congress and their cabinets. Partly this was an issue of logistics. Even if presidents had wanted to reach the masses, the tools required to do so didn’t exist; there were no twenty-four-hour cable news stations, satellite radio stations, Internet news and gossip Web sites, or armies of citizen-journalist bloggers such as those that patrol the Web today. So instead, politicians targeted their communication to the legislators and to a small, elite population who had regular access to newspapers. June 28, 2006 l National City Church, Washington, D.C.